Green and Tangerine on Red was executed in the mid-1950s, when he painted scores of large canvases. All have a similar format, but vary widely in mood, depending upon their color and internal proportions. Rothko resisted being labeled a "Color Field painter," insisting that his art concerned the distillation of human experience, both tragic and ecstatic, to its purest form. His goal was to abandon any visual obstacles detracting from the central idea. Rothko's paintings, heavy with implied content and emotional impact, ventured beyond abstract representation to embody the drama of humanity. Green and Tangerine on Red is composed of two massive rectangles, one dark and one light. 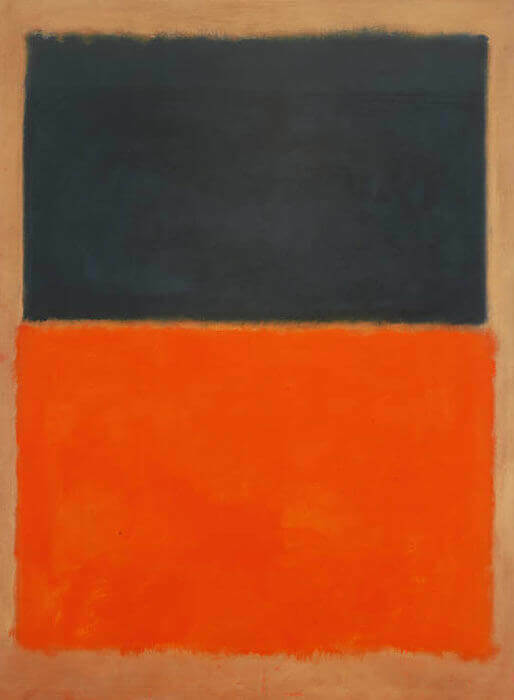 Rothko's once asserted that "the striking tangerine tone of the lower section of [Green and Tangerine on Red] could symbolize the normal, happier side of living; and in proportion the dark, blue-green, rectangular measure above it could stand for the black clouds or worries that always hang over us." 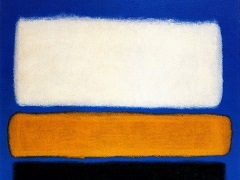 This statement expresses the opposing emotional states that Rothko's works can evoke. Through countless color manipulations executed on a large scale - an approach comparable to that of a composer arranging musical notes - he created powerful, timeless absolutes of human sensation ranging from exultation to torment.